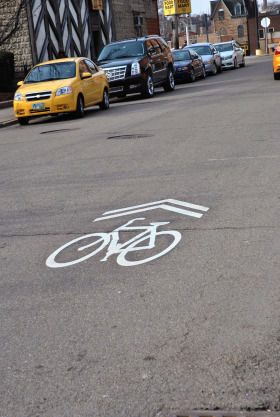 The City of Pittsburgh Departments of Mobility and Infrastructure and Public Works advise that the installation of bike lanes on portions of Forbes Avenue and Bigelow Boulevard in Oakland will begin on Tuesday, August 15, 2017. Installation is expected to last one to two weeks and is weather dependent. Streets will remain open to traffic but road users should expect changing traffic patterns. Port Authority bus stops will remain active through the work area. Forbes Avenue is currently a 4 lane, one way road with heavy traffic and lacks a safe route for cyclists comminuting through the university campuses. The Forbes Avenue project will add bike lanes in both directions on Forbes Avenue from Bigelow Boulevard to Craig Street, connecting the University of Pittsburgh, Schenley Plaza, the Bayard Street bike lanes and Oakland’s two business districts (Forbes Avenue and Craig Street.). City of Pittsburgh officials, including Mayor Peduto and District 8 Councilman Dan Gilman, have been working closely with PennDOT, the University of Pittsburgh, Carnegie Mellon University and other community stakeholders to ensure that ongoing improvements to the Fifth/Forbes Avenue corridor will create a safer environment for all residents and roadway users. Adjacent to Forbes Avenue, Bigelow Boulevard between Fifth Avenue and Forbes Avenue is a block-long gap in the existing bicycle network. The City of Pittsburgh has been working closely with the University of Pittsburgh on the short-term and long-term designs for this block. The 2017 installation of bike lanes and reconfiguration of the street is the first step towards a long term, complete streets vision for this portion of Bigelow Boulevard. Costs associated with the Forbes Avenue and Bigelow Boulevard bike lane projects are allocated from the 2017 City of Pittsburgh Capital Budget funds. The total cost of materials (pavement marking installation, flex posts) for both projects is approximately $45,000. Work is scheduled to be completed by the end of August 2017. Bicycle signals are included in the project but will be installed at a later date. The Oakland neighborhood, Pittsburgh’s second largest job center, has a high concentration of people riding bicycles due to its job density, high student population and density of destinations. The added bicycle facilities are part of an overall transportation network plan.